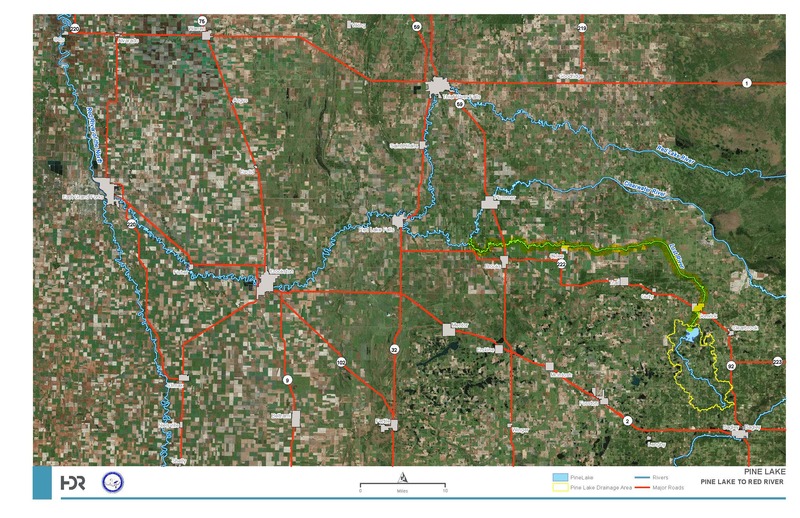 A region-wide goal has been established to reduce peak flows along the Red River of the North (Red River) by 20 percent during a flooding event similar to the 1997 flood. In order to reach this goal, each tributary of the Red River has been provided with peak flow and volume reduction goals as set forth in the Red River Basin Commission’s (RRBC) Long Term Flood Solutions (LTFS) Basin Wide Flood Flow Reduction Strategy Report. Several large-scale modeling efforts have been conducted throughout the Red River Basin to assist in determining the amount of effort required to meet the flow and volume reduction goals in each tributary basin of the Red River. The Pine Lake subwatershed has been identified as a strategic area to add stormwater retention in order to reduce downstream peak flows. Pine Lake is located in northwestern Minnesota within the Clearwater River subwatershed of the RLWD. In 1980, the Clearwater County Board of Commissioners petitioned the RLWD for an improvement of the Pine Lake outlet that would provide the public with flood control measures and wildlife benefits. The project, which was completed in 1981, consisted of a sheet pile dam with two adjustable stop log bays located on the Lost River approximately 700 feet north of Pine Lake. Pine Lake Watershed Improvement Project, Click map for larger version. Runoff from 45 square miles of drainage area causes rapid increases to the lake’s water surface elevation after storm events. During 13 of the last 33 years there have been flooding concerns in the subwatershed. While there are lower lake levels in the late summer, fall, and winter, these seasons typically result in water quality issues. The project has provided many years of flood control benefits to the area; however, over the years of operations it has become evident that the current project does not provide adequate flood control and recreational benefits. A Project Team was created to explore alternatives available to modify the current project and reduce flood risk to local landowners, enhance environmental conditions within the subwatershed, and add recreational benefits to Pine Lake. The Project Work Team agreed that the primary alternatives that might be explored include modification of the existing outlet structure and adding water-detention facilities upstream of Pine Lake. A feasibility study was completed to examine the potential benefits of the two stated alternatives. The current project will be completed for the RLWD in accordance with NRCS procedures. The end result of the project will be documentation of environmental resources within the watershed, evaluation of alternatives, documentation of environmental impacts and design performance of evaluated alternatives, determination of environmental status (Categorical Exclusion, EA, Environmental Impact Statement ), and selection of a preferred alternative that meets project goals (assuming the project does not warrant further study through completion of an EIS). The projects goals will benefit the local community by modifying the outlet to assist with preferred summer and winter lake levels, manage agreeable lake levels, and improve water quality. Additionally, the project will provide upstream storage to reduce persistent flooding conditions, manage lake levels, and improve water quality in the lake and downstream river reaches. The next Pine Lake project team meeting will be held on Friday July 21st, 2017 . Click graphic for larger version. All dates are tenative and subject to change. Please take a moment to print and take this survey.Pine Lake Survey. Completed surveys can be mailed to or dropped off at the RLWD office in Thief River Falls.